February 25, 2005. 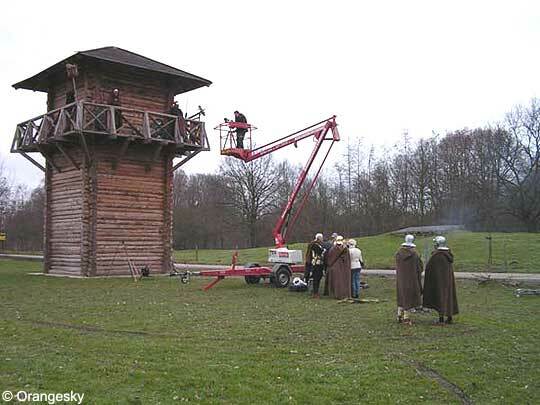 Roman watchtower, Bunnik, The Netherlands. "At least nobody had to act like they were freezing.."
To shoot the first scene of a film is a very special moment. Months of preparation and hard work finally gets to be rewarded, that is, when all goes well. Today we shot the scenes of Roman auxiliary soldiers shivering in the winter cold at a frontier outpost of the Roman Empire. We tried to capture the desolation and loneliness those soldiers must have felt here at the edge of civilization. 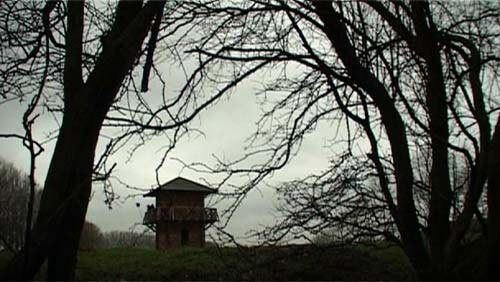 We found a perfect location in Bunnik, near Utrecht, at the site of a 19th century Dutch fortress called Fort Vechten . Okay, that has nothing to do with Romans, but at this same spot once stood a Roman military camp called Fectio. 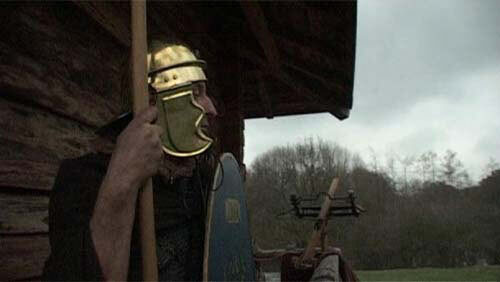 To commemorate this Roman heritage, a reconstruction of a Roman watchtower was built here last year. 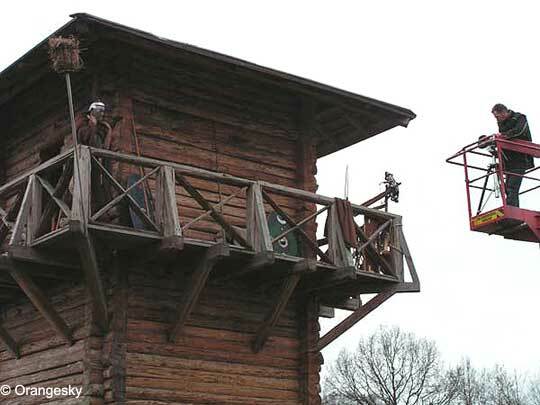 Having obtained permission to shoot some scenes here, we first began stripping the tower of all modern objects, like the iron fence around the banisters. Then we needed to turn it into a place that seemed permanently inhabited. 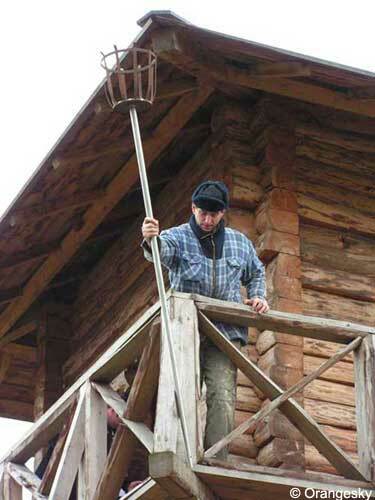 Finally a light beacon, specially made for the film, was installed at the side of the banisters. 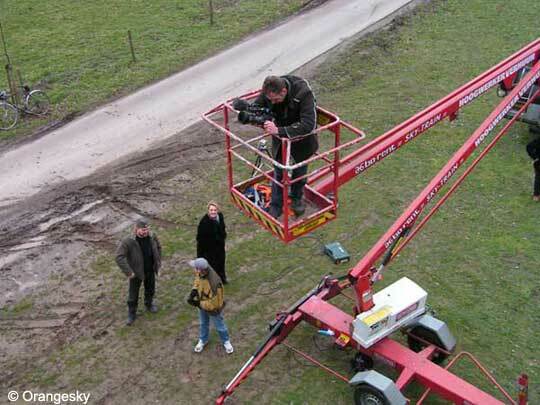 Meanwhile, cameraman Victor operated the crane in order to reach the same level as the soldiers. 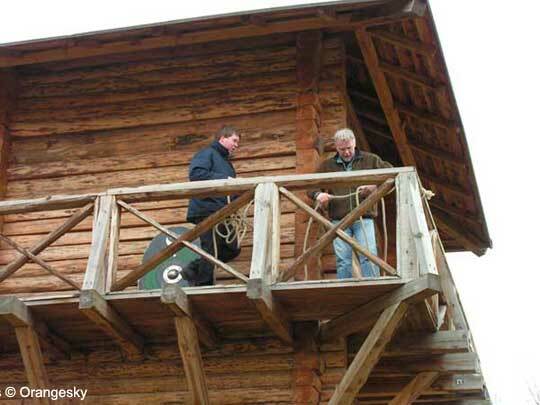 Several angles from which to shoot the scenes were investigated. 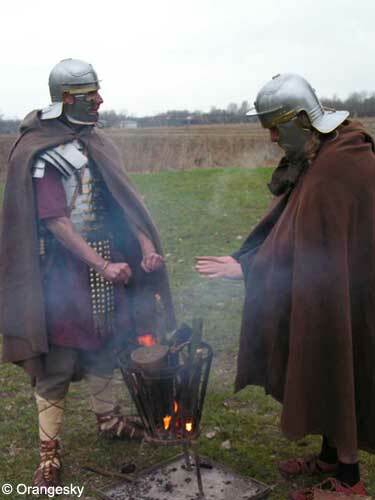 And while the catering kept pouring hot coffee and tea to keep us all from freezing, the first extras had changed into Roman military outfits and were ready to go to make up. These extras are members of the Gemina Project, a historical re-enactment society dedicated to reconstructing Roman armor and equipment. 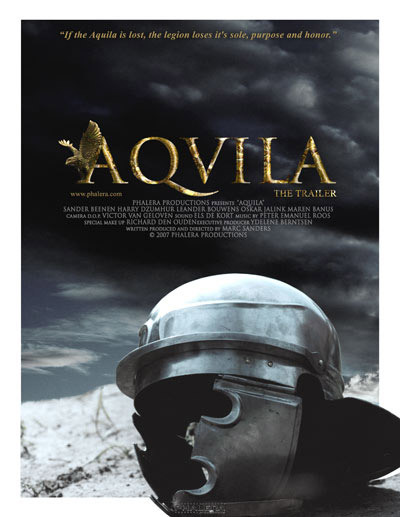 Without their help we wouldn't have had the most accurate Roman outfits ever seen in a movie. 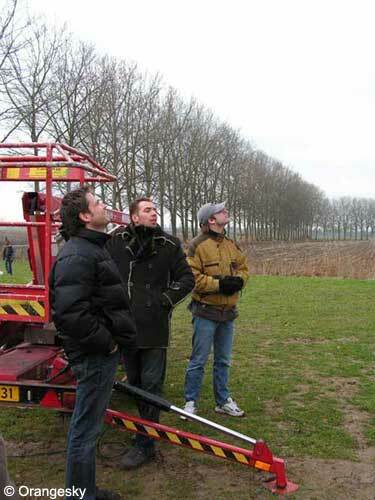 The first scenes were done very rapidly. It took three shots to cover the two soldiers freezing their butts and looking completely bored by their dull routine. The next scenes were more complicated: The enemy is approaching. The watchtower is in full alert. 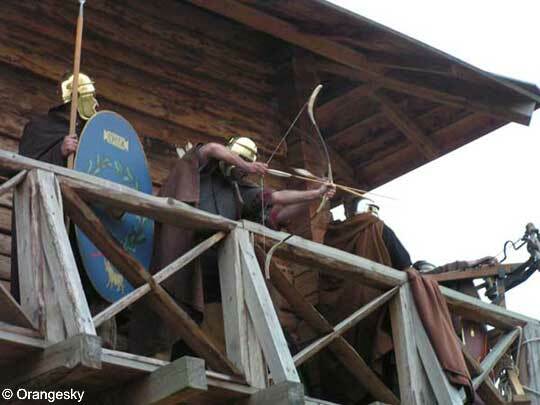 Roman archers appear and the artillery crew is preparing the ballista to shoot several leathal arrows towards imaginary Germanic warriors running towards the Roman frontier outpost. 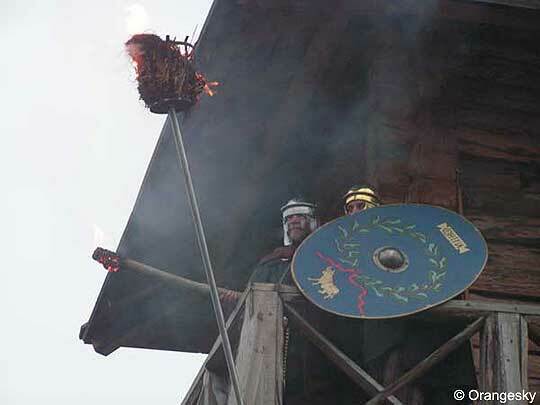 While arrows are being fired, another soldier carrying a burning torch runs along the banister towards a light beacon in order to alert the other Roman outposts of the danger at hand. He lights the beacon and the camera focuses on the growing flame. Cut! In less than three hours all shots were covered and everybody ran for the cantina to get warm soup and sandwiches. Today was the first time most crew members actually met each other. The atmosphere was jovial and relaxed. A taste for more, that's for sure. Thanks to all the volunteers without whom we never could have achieved this authentic\par look of a distant past. Call for help - lighting the beacon. The metalwork has been removed to gain historical accuracy. 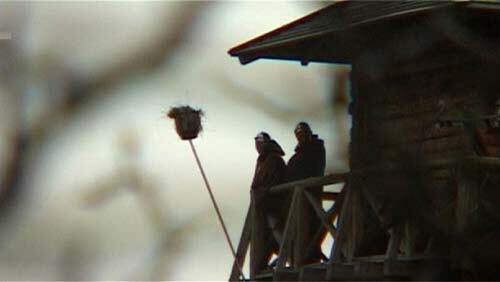 The set - it was very cold for both actors and crew..
Cameraman Victor operated the crane.